I guess it doesn’t hurt that orcas are essentially big dolphins — very big (think of the difference between a smart car and two tractor-trailers). Orcas are social creatures, interacting with each other in complex and fascinating ways. And just as with dolphins, people report uncanny stories of connecting and interrelating with them. Not surprisingly, American Indian and First Nation tribes revere orcas. And it seems that every camera- and cell phone-toting eco-tourist on the West Coast can’t get enough of them–they’re practically celebrities. More than 400,000 people went whale watching in the waters off Washington State and British Columbia in 2014 alone. They also talk — and each pod has a unique language. Just as we can tell the difference between a Texan and a Bostonian, scientists can tell the difference between groups of orcas. They celebrate. All three pods acknowledge each other, lining up as families when they come back into the Salish Sea. And just like some of us, they’re picky eaters. Orcas eat only what mom eats, which means almost nothing but salmon — 97 percent of their diet — but not just any salmon. They prefer the biggest and fattest of them all — the Chinook. These orcas move with the salmon, hugging the inland waters of Washington State to southern British Columbia from spring to fall. In winter, they expand their range south to California and north to Southeast Alaska. Yet they face a major problem — a lack of food. The mighty rivers of the West — including the Columbia Snake River watershed, a key source of Chinook — have been broken. Though the Columbia Snake once brought salmon all the way from inland northern Nevada to the Pacific Ocean, today it is full of dams. The four lower Snake River dams kill millions of Chinook juveniles every year as they attempt to migrate downriver to the ocean. In the course of just a few decades, Southern Resident orcas went from gorging on a salmon-rich buffet to searching for some measly leftovers. 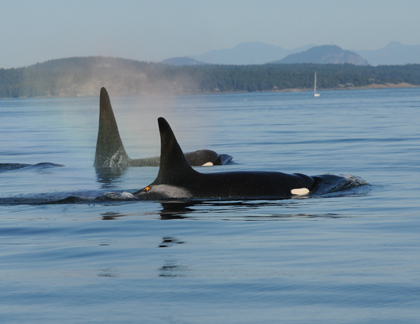 As of early August 2015, there are 81 Southern Resident orcas. Four of these are calves born in the past six months. No calf has survived in the past two and a half years, though so these newest “little ones” aren’t out of the woods yet. Mortality rates for first-born calves are in the 37-50 percent range. And many more of these orcas have died than survived (21 from 2010-2014). The Southern Resident population is moving in the wrong direction. Scientists had pinned their hopes on Rhapsody (J32), who had just reached mom-age at 18- years-old, to help her whole extended family grow. But in December 2014, hearts were broken when Rhapsody died carrying a nearly full-term female baby. A scientist who has studied these pods for 40 years surmised that Chinook salmon were so scarce that Rhapsody relied on her own blubber to keep her going. But as she tapped into that blubber, toxins stored there (called bioaccumulation) were released, harming her immune and reproductive systems. Her passing renews concerns about the fate of this whole population. While whale lovers and Rhapsody’s family grieve for her, we have a chance to turn this sad story around. We can commit to save this extended family in time. The solution isn’t just great for orcas, it is also great for people, salmon and all the species that rely on them. The solution has the added benefit of being extremely cool — like a Die Hard movie cool.